Another month, another Indian restaurant opening its doors to the increasingly ethnically-orientated Krakow food scene. A few years ago, the market was sewn up by a couple of reasonable if not world-class options, one of which, the well-established Indus, is only a few doors down from this new locale on ul. Sławkowska. These days, there are at least a dozen places serving curries from the sub-continent, and most expats argue over their own personal favourites, whilst many Poles have converted to the previously little-known spicy flavours. It’s fair to say that whilst none are truly terrible, most are not award-winning either. So, where does Indian Connection fit in to this pageant of papadum purveyors? I dropped in last Friday to find out. For a Friday night, 8pm, the restaurant seemed surprisingly empty – we were the only customers, in fact. Not a problem getting a table at least. The downside is the lack of atmosphere; a few candles and decorations lend a little warmth to the two cellar rooms, but a few pictures of India wouldn’t go amiss. The overall ambiance is somewhat lacking, and the fairly inexpensive décor and fittings don’t do much to help the situation. The menu is fairly standard for Krakow Indian fare; it’s northern Indian, including mostly meaty curries rather than milder vegetarian or fish-focused dishes from the south. I wonder if Indian restaurants in Krakow aren’t missing a trick by never offering dosa, for example. I noticed the menu does offer breakfast options, including ‘Scottish breakfasts’ which looked distinctly un-Scottish. A better sop to the expat and tourist crowd would surely be to offer lunchtime specials. Unable to order papadums as they weren’t available, I ordered something called ‘chicken lollipops’ for a starter (19zł). 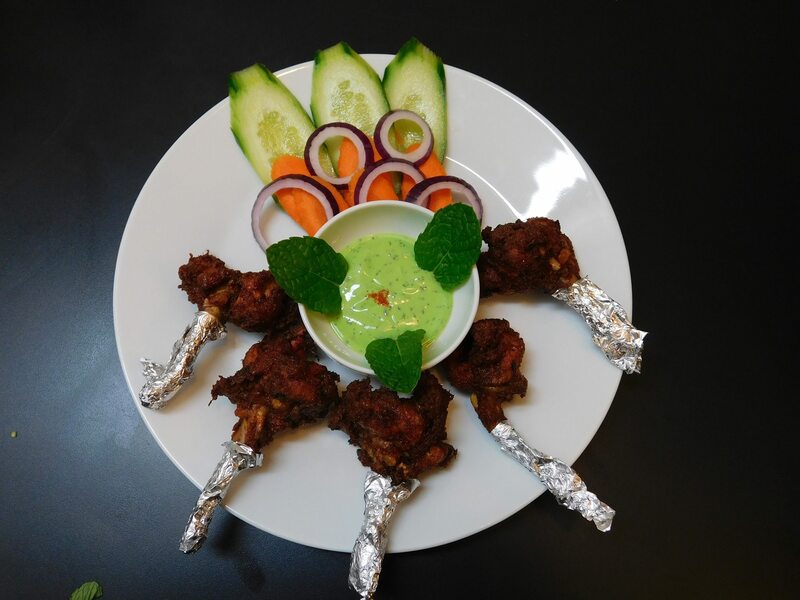 These were tandoori chicken drumsticks served with two dips – one sweet chili and the other yoghurt with mint (listed as ‘ketchup’ and ‘chutney’ respectively which they decidedly were not, whilst the drumsticks were named ‘wings’ – surely good English translations aren’t too much to ask). They were actually quite good – well-cooked and with the requisite amount of spice for a starter, and I was quite satisfied with them. 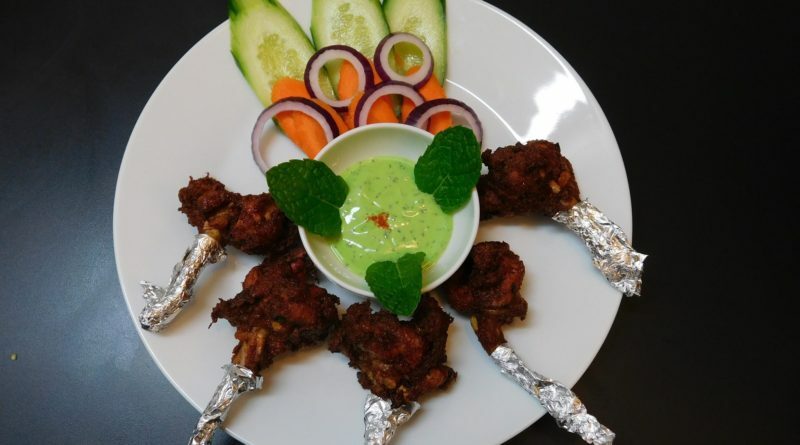 My partner’s Gobhi Pakora – deep fried cauliflower with the same dips – were mildly spiced, tasty, crispy and well-cooked inside. A soup followed – spicy creamed mushroom (12zł). Whilst not an intrinsically an Indian dish, it was excellent. Creamy, full of mushroom flavour and nicely spiced with chili. I’m a fan of soups served in generous amounts (who wants a thimble-full?) and this didn’t disappoint in that respect either. So far, so good. For the main course, I ordered the Indian Connection Special – a mixed grill involving chicken cooked in three different ways and king prawns. However, I was thwarted in this as, grilled food isn’t yet available (why is it on the menu? ), although I was assured it soon would be. I ordered a dish called Lamb Karahi (31zł) with veg pilau (12zł) and garlic naan (9zł) instead, whilst my partner went for a prawn masala. We had to wait a good half hour for these dishes, not a great sign in an empty restaurant, and during this time I sampled a couple of the beers available – a Żywiec wheat beer and an IPA, both bottled. These weren’t advertised on the menu for some reason, but apparently go for 7zł each, which is very reasonable. On arrival, our dishes were not disappointing. My lamb dish, which I had requested to be medium spicy rather than mild as advertised, was fine to my taste – it’s not a lot to ask, perhaps, but far too many Indian places in this town have failed such simple requests. Adding or reducing spiciness is a basic. The ginger and garlic sauce was delicious and the lamb itself was lamb, rather than stringy mutton – pretty tender and tasty. My partner’s prawn masala, she reported, was also very tasty, and it did seem to be. Both portions were of a decent size. I did find the rice to be a little bland, and served boiled rather than lightly fried and spiced as a I prefer it, and the naan was merely acceptable – not very crispy and a little under-cooked. Overall though, an acceptable main course. I reflected that some nice dishes and serving pots would have made the experience more pleasurable, and certainly large plates should be a basic – we were only given small ones to eat with. Details perhaps, but ones which add up and detract from an experience. All that was to follow was a very modest dessert – Galub Jamun – two deep fried milk balls served in a sugary syrup (12zł) – one of only two options on the menu (the other being ice cream). Not a dessert to linger long in the memory, but an agreeable enough end to the meal. Overall then, can I say that this new Hindu offering curried favour with me? I’d give it a qualified thumbs-up for now, and I hope it can up its game because at the moment it shows promise, but offers little that other, more established joints in Krakow don’t already do, at similar prices (my meal with drinks was about 100zł). What we had was for the most part, quite good though, and I would consider coming back again to try the grilled dishes and some of the chicken dishes like biryani and jalfrezi, among others. Vegetarians are pretty well catered to, and there are some fish and prawn dishes too. On the drinks front, it’s a bit lacking, but I’d never judge an Indian restaurant by its wine list. A few cold beers is the only real essential here. Some more ambitious dishes, more competitive prices, and some work on the ambiance might be in order, and it would be a good idea if they started competing in the lunchtime market by offering deals then. If you’re in this part of town and want to try something new, you’ll be unlikely to regret coming here for a lunchtime snack or informal meal. Connecting with a willing audience in this city who aren’t just tourists isn’t as easy as it once was, as many restaurants are finding out. Let’s see if this Indian does. ← QUIZ: How should you spend Valentine’s Day in Krakow?